A gastroduodenostomy is a surgical reconstruction procedure by which a new connection between the stomach and the first portion of the small intestine (duodenum) is created. A gastroduodenostomy is a gastrointestinal reconstruction technique. It may be performed in cases of stomach cancer, a malfunctioning pyloric valve, gastric obstruction, and peptic ulcers. As a gastrointestinal reconstruction technique, it is usually performed after a total or partial gastrectomy (stomach removal) procedure. The procedure is also referred to as a Billroth I procedure. For benign diseases, a gastroduodenostomy is the preferred type of reconstruction because of the restoration of normal gastrointestinal physiology. Several studies have confirmed the advantages of the procedure, because it preserves the duodenal passage. Compared to a gastrojejunostomy (Billroth II) procedure, meaning the surgical connection of the stomach to the jejunum, gastroduodenostomies have been shown to result in less modification of pancreatic and biliary functions, as well as in a decreased incidence of ulceration and inflammation of the stomach (gastritis). However, gastroduodenostomies performed after gastrectomies for cancer have been the subject of controversy. Although there seems to be a definite advantage of performing gastroduodenostomies over gastrojejunostomies, surgeons have become reluctant to perform gastroduodenostomies because of possible obstruction at the site of the surgical connection due to tumor recurrence. aiming for at least 0.8 in (2 cm) of margins around the tumor. However, because gastric adenocarcinomas tend to metastasize quickly and are locally invasive, it is rare to find good surgical candidates. Gastric tumors of such patients are thus only occasionally excised via a gastroduodenostomy procedure. Gastric ulcers are often treated with a distal gastrectomy, followed by gastroduodenostomy or gastrojejunostomy, which are the preferred procedures because they remove both the ulcer (mostly on the lesser curvature) and the diseased antrum. Stomach cancer was the most common form of cancer in the world in the 1970s and early 1980s. The incidence rates show substantial variations worldwide. Rates are currently highest in Japan and eastern Asia, but other areas of the world have high incidence rates, including eastern Europesan countries and parts of Latin America. Incidence rates are generally lower in western European countries and the United States. Stomach cancer incidence and mortality rates have been declining for several decades in most areas of the world. After removing a piece of the stomach, the surgeon reattaches the remainder to the rest of the bowel. 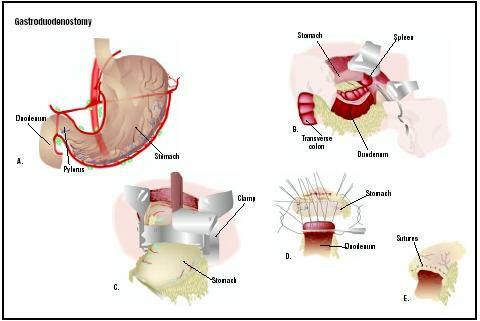 The Billroth I gastroduodenostomy specifically joins the upper stomach back to the duodenum. Typically, the procedure requires ligation (tying) of the right gastric veins and arteries as well as of the blood supply to the duodenum (pancreatico-duodenal vein and artery). The lumen of the duodenum and stomach is occluded at the proposed site of resection (removal). After resection of the diseased tissues, the stomach is closed in two layers, starting at the level of the lesser curvature, leaving an opening close to the diameter of the duodenum. The gastroduodenostomy is performed in a similar fashion as small intestinal end-to-end anastomosis, meaning an opening created between two normally separate spaces or organs. Alternatively, the Billroth I procedure may be performed with stapling equipment (ligation and thoraco-abdominal staplers). Endoscopy and barium x rays. The advantage of endoscopy is that it allows for direct visualization of abnormalities and directed biopsies. Barium x rays do not facilitate biopsies, but are less invasive and may give information regarding motility. Computed tomagraphy (CT) scan. A CT scan of the chest, abdomen, and pelvis is usually obtained to help assess tumor extent, nodal involvement, and metastatic disease. Endoscopic ultrasound (EUS). EUS complements information gained by CT. Specifically, the depth of tumor invasion, including invasion of nearby organs, can be assessed more accurately by EUS than by CT.
Laparoscopy. This technique allows examination of the inside of the abdomen through a lighted tube. The diagnosis of gastric ulcer is usually made based on a characteristic clinical history. Such routine laboratory tests as a complete blood cell count and iron studies can help detect anemia, which is indicative of the condition. By performing high-precision endoscopy and by obtaining multiple mucosal biopsy specimens, the diagnosis of gastric ulcer can be confirmed. Additionally, upper gastrointestinal tract radiography tests are usually performed. Preparations for the surgery include nasogastric decompression prior to the administration of anesthesia; intravenous or intramuscular administration of antibiotics ; insertion of intravenous lines for administration of electrolytes; and a supply of compatible blood. Suction provided by placement of a nasogastric tube is necessary if there is any evidence of obstruction. Thorough medical evaluation, including hematological studies, may indicate the need for preoperative transfusions. All patients should be prepared with systemic antibiotics, and there may be some advantage in washing out the abdominal cavity with tetracycline prior to surgery. After surgery, the patient is brought to the recovery room where vital signs are monitored. Intravenous fluid and electrolyte therapy is continued until oral intake resumes. Small meals of a highly digestible diet are offered every six hours, starting 24 hours after surgery. After a few days, the usual diet is gradually introduced. Medical treatment of associated gastritis may be continued in the immediate postoperative period. A gastroduodenostomy has many of the same risks associated with any other major abdominal operation performed under general anesthesia, such as wound problems, difficulty swallowing, infections, nausea, and blood clotting. Duodenogastric reflux, resulting in persistent vomiting. Dumping syndrome, occurring after a meal and characterized by sweating, abdominal pain, vomiting, lightheadedness, and diarrhea. Low blood sugar levels (hypoglycemia) after a meal. Alkaline reflux gastritis marked by abdominal pain, vomiting of bile, diminished appetite, and iron-deficiency anemia. Malabsorption of necessary nutrients, especially iron, in patients who have had all or part of the stomach removed. Results of a gastroduodenostomy are considered normal when the continuity of the gastrointestinal tract is reestablished. For gastric obstruction, a gastroduodenostomy is considered the most radical procedure. It is recommended in the most severe cases and has been shown to provide good results in relieving gastric obstruction is in most patients. Overall, good to excellent gastroduodenostomy results are reported in 85% of cases of gastric obstruction. In cases of cancer, a median survival time of 72 days has been reported after gastroduodenostomy following the removal of gastric carcinoma, although a few patients had extended survival times of three to four years. In the case of ulcer treatment, the need for a gastroduodenostomy procedure has diminished greatly over the past 20–30 years due to the discovery of two new classes of drugs and the presence of the responsible germ ( Helicobacter pylori ) in the stomach. The drugs are the H 2 blockers such as cimetidine and ranitidine and the proton pump inhibitors such as omeprazole; these effectively stop acid production. H. pylori can be eliminated from most patients with a combination therapy that includes antibiotics and bismuth. If an individual requires gastrointestinal reconstruction, there is no alternative to a gastroduodenostomy. See also Gastrectomy ; Gastrostomy . Benirschke, R. Great Comebacks from Ostomy Surgery. Rancho Santa Fe, CA: Rolf Benirschke Enterprises Inc, 2002. Magnusson, B. E. O. Iron Absorption after Antrectomy with Gastroduodenostomy: Studies on the Absorption from Food and from Iron Salt Using a Double Radio-Iron Isotope Technique and Whole-Body Counting. Copenhagen: Blackwell-Munksgaard, 2000. Kanaya, S., et al. "Delta-shaped Anastomosis in Totally Laparoscopic Billroth I Gastrectomy: New Technique of Intra-abdominal Gastroduodenostomy." Journal of the American College of Surgeons 195 (August 2002): 284–287. Kim, B. J., and T. O'Connell T. "Gastroduodenostomy After Gastric Resection for Cancer." American Surgery 65 (October 1999): 905–907. Millat, B., A. Fingerhut, and F. Borie. "Surgical Treatment of Complicated Duodenal Ulcers: Controlled Trials." World Journal of Surgery 24 (March 2000): 299–306. Tanigawa, H., H. Uesugi, H. Mitomi, K. Saigenji, and I. Okayasu. "Possible Association of Active Gastritis, Featuring Accelerated Cell Turnover and p53 Overexpression, with Cancer Development at Anastomoses after Gastrojejunostomy. Comparison with Gastroduodenostomy." American Journal of Clinical Pathology 114 (September 2000): 354–363. American College of Gastroenterology. 4900-B South 31st St., Arlington, VA 22206. (703) 820-7400. http://www.acg.gi.org . American Gastroenterological Association (AGA). 4930 Del Ray Avenue, Bethesda, MD 20814. (301) 654-2055. http://www.gastro.org . "Gastroduodenostomy After Gastric Resection for Cancer." Nursing Hands [cited June 2003] http://www.nursinghands.com/news/newsstories/1004031.asp . A gastroduodenostomy is performed by a surgeon trained in gastroenterology, the branch of medicine that deals with the diseases of the digestive tract. An anesthesiologist is responsible for administering anesthesia, and the operation is performed in a hospital setting. What are the risks associated with a gastroduodenostomy? How many gastroduodenostomies do you perform in a year? My son is having surgery on his stomach and small intestine! He was born with gastroshisis and arthrogryposis. He has had numberous surgeries, nissen, pilroplasty, and surgeries to put everything back in the adbomin. Since, the nissen my son's stomach has very little movement as well as his esophagus! I was told that the doctor could connect the small intestine to the stomach for motility! I am nervous, but excited for him because he can gain improvement in his GI tract with this procedure. Is there anything I should know about this type of surgery? Is this called a Gastroduedenostomy? If you could email me back that would be great, thanks again!! Did your son ever have the surgery and how is he doing since that time? I had a Gastroduedenostomy 8/2007 and still experience complications after eating. Wish it were easier for me, so I hope he is doing well. On 6/24/12, I had a gastrojejunostomy done. I have been able to eat normally and increased portions slowly. On 7/19/12 I had severe abdominal pain after eating breakfast. I also have severe swelling in my feet up to my calves. I have also tried to do some excersising (bench Presses) with 2.5 lbs. weights. What is the cause of the abdominal pain and swelling. I had a cancerous tumor removed and had never experienced any pain. Please help. Thank you. Do not listen to what annoye has responded so far, except mbcratz and zippy. The rest might mean well, but they gave horribly misleading responses.Here's the deal your mom's contract excludes gastric bypass. Unfortunately, it doesn't matter how much she needs it or what documentation the doctor sends in when something is excluded from your policy, medical necessity is completely irrelevant.Her doctor's office could send in all the documentation in the world to her insurance company's medical review department. The medical review deparment could look at it and say "yep, we agree 100% she is a perfect candidate for gastric bypass based on her medical information." And it still wouldn't matter exclusions are exclusions, period.Forgive me if I sound blunt or harsh, but I just wanted to be very clear some of the other answers are saying "oh, just have her doctor prove she needs it" and steering you in the wrong direction.No matter how much she needs it and even if the insurance company agrees that, medically, she "needs" the surgery, it will never be covered under her policy. No way, no how. Exclusions are exclusions, period.She has 2 options: 1) Save up the money and pay herself. or 2) Somehow convince her employer to stop excluding gastric bypass from their coverage options, which still wouldn't take effect until 2009 anyhow.I hate to be the bearer of bad news, but unfortunately it is what it is. What can someone who have gastroduodenostomy eat to build her blood level? (2) what can stop spitting? My father had undergone gastrojejunostomy 6 months back by open surgery (laparatomy). now we noticed swelling of his abdomen having incision, but he has no problem at all. what it may be & what is the remedy in such case.